May 2012 was a busy month for me and not short on accomplishments. I got lots of bonding time in with my son. I produced 6.15 gallons of milk. I had a photograph printed on the cover of The Journal of The American Chestnut Foundation. I got a short story accepted for publication at Luna Station Quarterly. On the work front, I had bug fixes, 6 AM support calls and pesky PDF conversions to troubleshoot. I added SFTP support to a service. New test regiments ushered in new features and new reports for the food labs. I worked on not one, but two, separate migration projects. I helped secure four new projects for the following month. But when I look back on May, one accomplishment manages to stand above the rest. My father has been ill this year and has had more than his fair share of doctor and hospital visits. In healthier days, he was an animated story teller and he possessed one of the most infectious and booming laughs. He has cracked me up more than all the famous, high-paid actors combined. He’s nearly asphyxiated me with laughter! But these days he is tired. These days he is grumpy. So when I see him, I try very hard to engage him. My efforts are often a stream of consciousness– me rattling off anything and everything that comes to mind that may be of interest. Dad is following the NFL playoffs? Oh, maybe he wants to see the Tim Tebow SNL video! 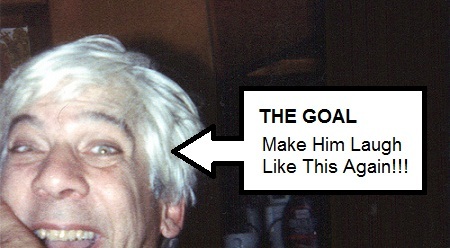 Dad loved the movie Borat– I’ll tell him about Sasha Baron Cohen’s antics at the Oscars! In 1999, Dad discovered it is amazingly painful to watch “American Pie” when you are recovering from a broken rib. Ooooh! Maybe he wants to hear news about “American Reunion“! I’ve had substantially more misses than hits. One day in April, I was on a conference call and my boss mentioned the amazing shot Bubba Watson made to win the Masters. A little light went off in my head. My Dad’s computer was live streaming golf scores!!! Dad asked me once to go check a golf score for him! This would be a talking point! My boss coached me with what to say. “Bubba Watson, Bubba Watson, Bubba Watson” I repeated to myself. The next day, I ran into my father in the kitchen. I was rather pleased with myself for remembering the details, but my pride was short-lived. “That was last week!” Dad scoffed and walked away. Just a few weeks later, Dad had a particularly rough night. He spent the whole night vomiting. The whole night. Ryan, Sagan and I stay above my parent’s bathroom so we got to hear each and every heart-wrenching trip. Dad sounded absolutely miserable and you are just overwhelmed with helplessness when you hear a loved one like that. The next afternoon after work, I stopped by my parent’s bedroom to see how Dad was doing. He was huddled under the covers looking pale. “How are you feeling Dad? Are you still vomiting?” I asked. Personally, I would be hard pressed to ever classify “passing gas” as worse than “vomiting”. Nonetheless, a little light went off on my head. I had a story! Something amazing happened. After being up all night sick and despite all the fatigue and pain and everything he must have on his mind, my father smiled and let out a little chuckle. 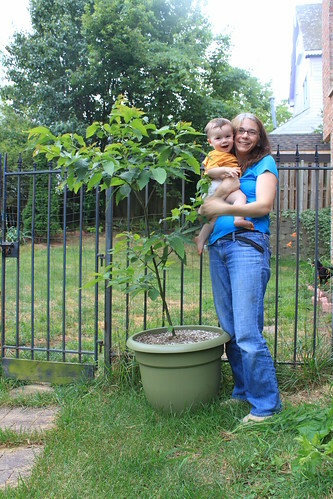 Happy 2nd Birthday, American Chestnuts! 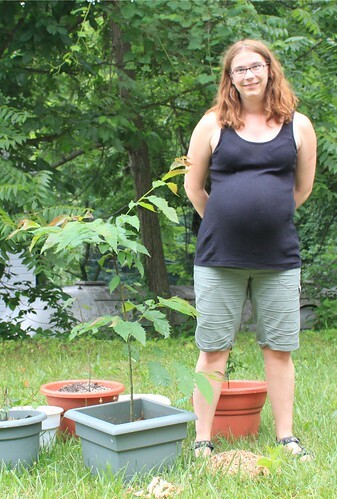 Our Restoration Chestnuts from the American Chestnut Foundation were planted on June 17th and June 18th of 2010. That means they celebrated their second birthday earlier this week! Like last year, we celebrated with some photos! Due to the long approval and construction process with our new home, the trees had to winter another year in pots. Luckily, they had an extremely mild winter to contend with. This year, I have an 11 month old son!!! This should be the last birthday picture of the tree in a pot. 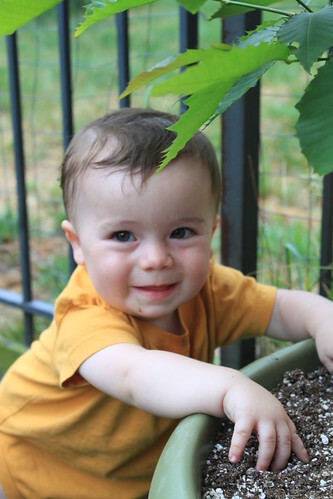 I look forward to seeing how both the tree and my son grow in the coming years!